I was invited for video interview which I was asked to complete by November 4, 2015. I did that but haven't heard from the admissions committee after that. Is there anyone else who was invited for Video Interview only? Is it over for me ? Seems like there's a few of us who sent in the video interview and haven't received feedback. I'm not going to assume a ding quite yet but it is getting late. Has anyone who had been invited for video interview only heard back from the adcom yet? Wrote to admissions and they said they are still reviewing the applications and we should get notification around 15! But looking at the time, I think its a ding. Two weeks. The waiting is the hardest part! Have any R2 applicants received interview invites? Last year they went out 10 days later. Havent seen any chatter about it at all. For round one was about two weeks after submission that they went out. Most likely soon. Got mine a few minutes back. Contained invitation for video & skype interview. I too got an interview invite today. Both video and skype interview. Got only an video interview invite...no skype interview invite in round 2. Is it a matter for concern? I also got only the video interview invite. So guys is it a matter of concern? "You may be invited to complete a short video interview while your application is under review. Once invited, candidates are generally given one week to complete the video interview—you will need a computer with internet access, a webcam and a microphone. The video interview allows us to get to know you better, assess your communication skills and assess your ability to think on your feet. Competitive candidates will also be invited to complete an interview with one of our admissions representatives (see below). If invited to complete both, you must do so in order to remain under consideration." It's pretty clear from that statement that receiving only the video interview is less desirable than receiving both interview invites. For some reason they have viewed your application as less competitive. My interpretation is that they probably have some kind of a reservation about your application. This could be any wide range of things. Possibilites that come to mind are low GPA/GMAT, limited or less relevant work experience, poor essays, unclear or illogical goals, goals are poor fit with Foster, or some combination of those. Overqualification could theoretically be a possibility too. It might also mean that your specific demographic was particularly competitive in this round and while you are well qualified you were slightly less so than your overrepresented demographic and they want to see how other applications shake out. All that being said, if last year counts for anything those with just video invites are definitely not out of the running! Last year that were reports of people initially getting just the video interview, then later being invited for the admission interview and getting admitted. I also saw examples of people getting just video, then waitlist, and later getting admissions interview and ultimately admitted. These are all just my opinions/guesses based on very limited information, but it's where my thought process takes me. I'll be doing my video this weekend probably and admission interview in a couple weeks. Best of luck to all! Today we have a special guest blog by Caitlin McElwrath, Class of 2017! 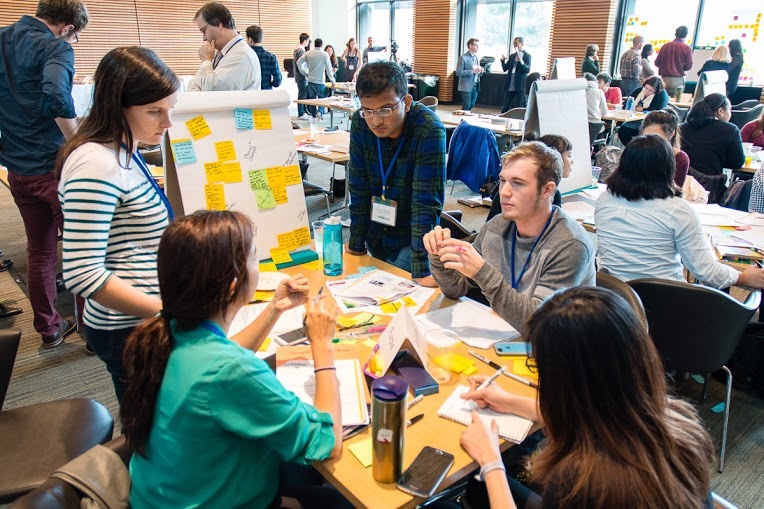 Caitlin attended the 2015 Toyota and Net Impact Next Generation Mobility Challenge at the University of Washington, a competition where multidisciplinary teams of students work together to dream up and map out innovative solutions to a specific mobility or transportation issue. The winning team from the challenge will have an opportunity to receive summer internships with Toyota to incubate their ideas with their innovation partners. Read about Caitlin’s experience below! One month into the Foster MBA program I found myself at the Toyota and Net Impact Next Generation Mobility Challenge. On my team there was a transportation engineer, industrial engineer, human centered design engineer, a construction manager and me, the MBA. I signed up for the event because it reminded me of the engineering challenges I did as an undergraduate in mechanical engineering. I jumped at the opportunity to work with engineers again, perhaps subconsciously seeking the comfort of the familiar in this whirlwind of an adventure that has been my first month as an MBA student. Leading up to the event we were given information and materials regarding the current state of mobility and some of the problems Toyota and Net Impact are focusing on – productivity, safety, and happiness in the field of transportation. When I arrived and met my team, we started talking about which of the personas from the reading materials we identified with the most and started throwing out ideas before we had even finished our coffee. Our excitement got a little bit ahead of us as we forgot that the schedule of the day wouldn’t have us even start brainstorming for another couple of hours, after we had discovered and framed. Using a classic human-centered design approach, our process was split into four parts: discover, frame, imagine and prototype. This part of the day was focused on delving deeper into the persona of our choice. The goal was to really learn about the pains and gains our customer faced in regards to transportation. My team picked Reed, a teenager who loves driving, gives his friends rides all the time and doesn’t quite feel comfortable behind the wheel yet. The materials provided to us included a template of an empathy map and user journey to better help us get inside Reed’s head. The presenter put this quote on the screen and it resonated with me and my team. Even in the Discover portion of the day, my team found it difficult not to get too far ahead of ourselves and skip right to the solution, and it was through this Framing part of the day that we really realized how much we needed to focus on what Reed’s real problem was before we figure out how to solve it. The best part of the day, in my opinion. This is when the creativity really lets loose and you brainstorm for the problem at hand. My team had a ton of ideas jotted down on post-it notes, and I began to worry about being able to narrow it down to one idea. However, once we started organizing the ideas into groups and really focusing on if they addressed the problem at hand, we came to a solution naturally. Having industry professionals in the room as mentors to guide us along significantly helped us in this portion as well. I’m used to prototyping for engineered solutions, I know how to use cardboard and pipe cleaners to illustrate the functionality of the product being pitched. However, in this case our solution was more of an experience that we decided to convey with a story board and role play. At the end of the prototyping phase, we got to present our idea to the judges and see everyone else’s pitch. I was amazed at the variety and completeness of all the other teams solutions. We had all been given the same material, all gone through the same steps, and yet every team had a completely unique well-thought-out idea. I was amazed and humbled to be included in such an amazing group of individuals working together to solve these very real mobility challenges. I originally signed up to do something familiar, however I ended up completely outside of my comfort zone, and I am a better designer and business leader because of it. Read more about Net Impact and other student clubs here. For more about the Net Impact and Toyota Next Generation Mobility Challenge, click here. Caitlin McElwrath, Class of 2017, holds a Bachelor’s degree in Mechanical Engineering and prior to Foster worked at Eaton Corporation in manufacturing and project management for power management equipment in the data center industry. She also taught children in K-5th grade engineering concepts using LEGO at Play-Well TEKnologies. She’s currently focusing on Product Management and Marketing at Foster, but also considering consulting. To find out more about Caitlin, visit her LinkedIn profile here. Guys, what's the conversion rate from interview to admit like for Foster? It's very hard to wait till 15th. Has anyone done their video interview for R2? I was wondering if the questions were similar to the ones posted earlier in this thread. I took it in round 1, but my guess is yes they'll be from the same pool as I doubt they've recorded new video prompts for this round. However, there seems to be a wide variety of them, as I looked at every question that had been put forward by previous takers and ended up having two questions that hadn't ever been seen before. Still good practice to go through and think of how you would respond to them. Plus, since they generously give you 30 seconds to gather your thoughts, you should be fine as long as you stay calm and confident. Best of luck! Just finished my video interview. My suggestion is don't plan to give it on last day. It took so much time for me to setup. Onc eyou check-in it takes you to a page where it check for your network connection, webcam & mic functionality. I initially had network issues and had to wait to try with another internet service provider then I had problem in setting up the devices. For some reason the page could not capture video (I do many skype calls and google hangouts that work perfectly fine). I spent some hours trying to trouble shoot it. Finally went into a friend's place and tried it there. Thankfully it worked. However I had to give the answers in hurry and in not so nice environment. I guess i did ok but not satisfactorily. Waiting for the skype interview. Btw, my questions were on some new project i had worked and qualities of my supervisor. Good Luck guys. Just gave my video interview. My first question was about an important piece of advice I have received and how it has helped me? I don't exactly remember the prompt for the second question, but it was related to 'Creative solution at work'. I think my interview went okay, I feel I could have done better on the first one. I have a Skype interview in a couple of days, will update as soon as I'm done with it. Good luck everyone!! Today we have a guest article from Peter Kazarian, Class of 2016! You may remember Peter from his story about his amazing experience at the MBA Study Tour to Japan last spring. In October, Peter organized and led the annual Foster Technology Club’s Bay Area Tech Trek, a student-run event that takes Foster MBA students on a tour of Silicon Valley tech companies. Read on for Peter’s recap of the event! San Francisco. The Bay Area. This little patch of land in Northern California that gave us great bands (Journey, Smash Mouth) massive burritos (copied decades later by Chipotle) and the tech industry as we know it. High tech is responsible for 11.4% of US private sector payroll, and grows every year, just like Foster’s B-school ranking. Our largest student club, Foster Tech, organizes an annual trek down to the Bay Area to meet with some of the biggest brands you use every day. We see geeky product demos, we chat with recruiters, and we hear from local Foster alums – on what the MBA experience looks like at a tech firm. As a Silicon Valley native and a VP of Foster Tech, I was part of the team in charge of the Tech Trek this year. We wanted to give our member students, especially first-years, the best experience they could have. Business students can really benefit from a thorough understanding of the industry, especially as we approach hiring season for full-time and internships. So 50 of us bought tickets, rented cars and hotel rooms near SFO, and spent 3 days driving to 18 different companies like Google, Box, Zynga and others. Foster took the Bay Area by storm with one of our largest and longest Tech Treks on record. This was the first year we went to three days of content, but with local connections and plenty of help from our Career Management Office, we felt good about our chances. And we wanted to build the Foster brand in the Bay. We’ve been climbing the rankings in US News and World Report, Businessweek and others, but we’re located a bit up the street from San Francisco. Exposure in front of firms hiring from our peer schools was a key goal. And with this year’s additions of big players like Facebook, Twitter, and WalMart’s ecommerce arm, we can say mission accomplished. We were lucky enough to tour Facebook’s campus and hear first-hand from the team that originally launched ads on their social network Instagram. You know, the one social network people still love to use? I really appreciated the data-driven and community management approach they took to monetizing 400 million monthly users. This was one of my favorite stops. Then there were some great product demos. We stopped into Dolby’s San Francisco office and watched the Star Wars VII trailer in a specially designed sound lab. We visited NVIDIA and saw some live-rendered physics scenarios at 4K resolution with graphics horsepower like I’d never seen. And my dad works at NVIDIA. We heard about the business applications of things like graphics cards in mobile, feature films, and even automotive displays. It was a great trip. On top of the business side we had daily alumni happy hours where we were able to bond and network with area graduates. Multiple cars were able to make a pit stop for In-N-Out Burger (try it if you haven’t) and I was able to take classmates to my favorite Indian food truck from my time in SF (Curry Up Now). A great experience to be sure. With dozens of Foster grads scheduled to head to the Bay Area in 2016 and beyond, it looks like this tradition’s only going to pick up steam. Going by the last year's thread the results for the first round came out on 12th Dec, but that was a Friday. Can we expect a result tomorrow (11th Dec , Friday) ? Yea i noticed that as per last year thread people did receive decision on 11th Dec, when deadline was on 15th.. Let's hope we get positive decision tomorrow and this stress of waiting will be over..